Tom King and Mikel Janín’s Part One of “The Tyrant Wing” is not just a poetic start to a harrowing arc but visually shows the strength and importance of family and loyalty for both the good and evil in Gotham. As the Batman continues to get to the bottom of who is behind the attacks on his Bat Family, The Penguin has been called in by the man who once broke the Bat to aid him in the Dark Knight’s emotional demise. But after a tragic death, the question of whether Cobblepot will join this villainous alliance is raised and will Penguin and Batman join forces for the good of Gotham. Tom King since the release of the wedding issue of Batman #50 has said the following comics will result in a major story for both the lives of the Batman and Bruce Wayne, seemingly coordinated by the super powered villain Bane. From his struggles with Mr. Freeze to the hunt for Nightwing, Batman’s crusade has been anything but pleasant – but has it ever? Bane is calling in more classic rogues to aid him in his new take down of the Caped Crusader by aiming at the ones that Bruce loves the most. Through King’s writing, Batman permeates concern and worry without stepping out of his familiar stoic persona. Perhaps the most impressive part of King’s story in this issue is his usage of William Shakespeare’s poem “The Phoenix and the Turtle”, which beautifully and appropriately highlights the love and loss of family for both Batman and the Penguin and how complex the idea of love can truly be. King’s usage of folk tales and Shakespearean poetry brings even more depth to an already fan favorite observation of this character and his mythos. Personally, I have been a fan of Mikel Janín’s work on the Batman publication and this issue did not change that fandom for me in the slightest. Switching scenes from bleak loss to the cold walls of Arkham to the very humorous moment in the Batcave, Janín’s pencils combined with Bellaire’s outstanding cool color pallet that changes the mood with a turn of the page just heightens King’s story. Janín’s art also showcases once again that the most important figure in the Batman mythos – besides Batman himself – is Alfred Pennyworth, the glue that holds Bruce’s troubled life and mental state together for the last 75 years. Batman #58 was an issue that stood out for me. 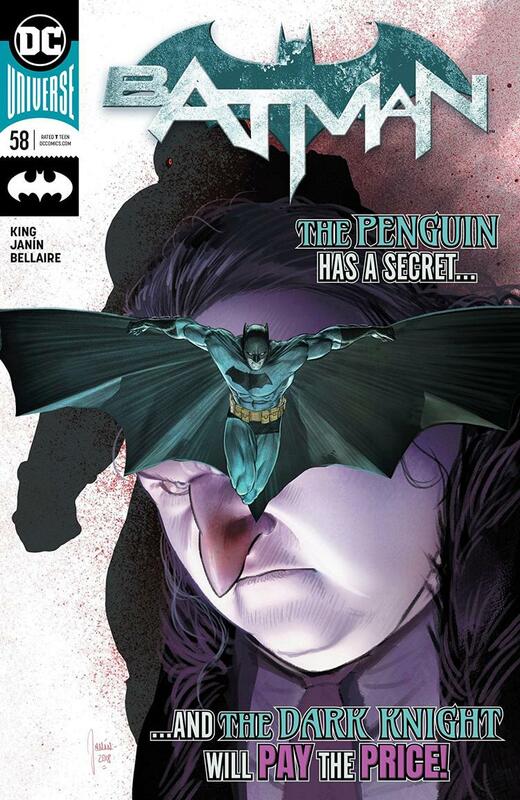 Penguin’s sympathetic side story and Batman having to use his better judgement to keep himself and his loved ones safe will draw the attention of any reader fond of these classic characters King’s “The Tyrant Wing” is already shaping up to be a deep dive into what defines Batman, something the writer has been tackling throughout his run thus far.